That’s Intriguing #83: Why Does Readers Digest Pass Sam Horn’s Eyebrow Test®? I rediscovered an old friend today. I’m visiting my sister and brother-in-law this weekend – Cheri and Joe Grimm – who have been running my business and website for the past 15 years. They gifted me with a stay in a delightful bed and breakfast here in Los Osos, CA (on the coast 40 miles south of Hearst Castle). I noticed a copy of Reader’s Digest on my night table, and impulsively took it with me this morning to read while enjoying my coffee and a fabulous view overlooking the bay. After the first few pages, fond memories came flooding back. I was first introduced to Reader’s Digest when my family and I would go to our Granny’s house in Eagle Rock, CA for Easter, Thanksgiving and Christmas holidays. If the weather was good, my sister, brother and cousins and I would play outside. If the weather was bad, we were “banished” to the back porch. And there, on the bookshelves, were stacks and stacks of Reader’s Digest. On some particularly rainy weekends, we would work our way through years of issues. I was once asked by a reporter where I got my “literary training.” Did I study journalism in college, have an English degree or a Ph.D. in Communication? My teachers were Walter Farley (The Black Stallion series), Nancy Drew and Ed McBain (our librarian was a bit scandalized when this 12 year old kid checked out the racy 86th Precinct books from our small town, one-room library). After delving into the May 2012 issue of RD, laughing out loud at pithy one-liners , raising my eyebrows at “didn’t know that” insights, and tearing out article after article offering testimony to man’s HUMANITY to man … I am struck by the profound influence Reader’s Digest has had on my writing, speaking and approach to life. For example, this My Most Unforgettable Character article entitled The Night I Met Einstein, (which RD notes is one of the most requested essays of the thousands in their archives), moved me with its timeless wisdom. Take a few minutes to read it and you’ll easily understand why. This was written more than 60 years ago (!) and is as powerful today as it was when Jerome Weidman first wrote it. It is an illustration of why I loved reading Reader’s Digest growing up – and was profoundly shaped by its recurring themes of decency, honor, resourcefulness, bravery, adventure and gratitude. I remember to this day reading a story about a mother standing at the kitchen sink washing dishes while watching her two kids outside flying kites on a windy spring day. One of them saw her watching and called out to ask her to join them. She waved them off and said she couldn’t because she had too many chores. She reminisced that now that her kids were out of the house and on their own, she often thought about that windy spring day and wished she had said YES when they asked her to come out and play. She realized, too late, her chores could have waited; their precious, all too fleeting, childhood wouldn’t. I would think of the presentations I had to prepare, the handouts I needed to create, or the calls I needed to be make … and then I would think of that article. Remembering that mom’s remorse about not playing with her kids while she still could – and while they still wanted her presence – prompted me to say YES instead of telling them I had work to do and was too busy. Buy a copy of Reader’s Digest and read it cover-to-cover while sitting somewhere in the sunshine – in your favorite chair by the window, at a local park surrounded by nature or out on your back patio. It will make you smile … i.e., an article in the May issue from children’s book author and Simpsons writer Mike Reiss who says a publishing house called him in a panic because a superstar celebrity client had turned in an unusable, overdue manuscript. They wanted Mike to re-write the book and have it ready – the next day. Reader’s Digest will get your eyebrows up with recent research. This month’s issue features tidbits on Decision Fatigue, and the fact that, just as we always suspected, Yawns Are Contagious, which is why we often release one of our own when someone nearby opens wide. It may even warm your heart and motivate you to be kinder to people you encounter. It may remind you, as does the article about Einstein opening the eyes, ears, heart and mind of a musical neophyte, of what really matters – listening, learning, loving and marveling at this wondrous world of ours. They are masters at condensing their content into intriguing 20 word, 50 word, 150 word insights that POP! Their headlines, “Cash Mob,” “Inspiring Minds Want to Know,” “We Couldn’t Make This Up,” and “50 Secrets Your Vet Won’t Tell You” create curiosity and compel you to keep reading because you want to know more. Their visually accessible copy with short paragraphs and frequent boxed off graphics show they know people like to dip in and derive value even if they only have a few minutes to spare. No dense, daunting text here. In short, all of us communicators – speakers, writers, advertisers, journalists, ministers, professors and sales and marketing professionals – can learn from their example. If you want to create intriguing headlines, insights and essays that pass Sam Horn’s Eyebrow Test®, you can. Purchase a copy of POP! and discover for yourself why it’s been sold around the world, featured on MSNBC, FastCompany and Business Week and hailed as the best source for crafting content that captures and keeps interest in what you have to say. 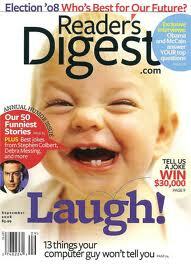 Do you have any favorite Readers Digest memories? Let’s hear them . . .
One of my favorite RD moments: sitting on a plane, turning the page and finding your Tongue-Fu article. I jostled the passenger beside me, and said, “I KNOW this author!! !” I was elated. I bet you were, too. Sam. Hey Tracey – thanks for making my day with that great memory. I walked over and watched a shiny piece of fax paper roll out of the machine and curl up and drop on the floor. I picked it up … and let out a “Whoopie!” when I saw it was from an editor at …. READER’S DIGEST. She said she loved my book Tongue Fu! and my style of writing … and would it be okay if they featured excerpts from Tongue Fu! in Reader’s Digest. After all those hours spent reading Reader’s Digest growing up; it was quite the thrill to open up an issue and find an article there from my work. They also featured an insight from my book What’s Holding You Back? – under Quotable Quotes on the same page as a quote from Maya Angelou. That also put a smile on my face and in my heart . . . Thanks, Tracey, for bringing back those fond memories . . . Hope all’s well with you. Still swimming and surfing in Hawaii?? More thrills! You and Maya Angelou on the same page, Sam? Now that’s waa-ay cool! You so deserve to share space with her. Right now I’m up to my chin in books as I co-manage the Hawaii Kai library book sale. When the rush is over, I’m off to the waves. I’ll catch one for you, and you walk ’round the lake for me. Deal? I have similar memories. For me it was the chance purchase of a whole carton of old issues at a school fair. I read and re-read them while I was growing up, always returning to them while I waited for a new issue to come out. Great days!